If you don't stay up till the wee hours of the morning you might have missed this. While KC Masterpiece is certainly far removed from the historic beginnings of Kansas City barbecue, it was, for better or worse, the beginning of a stereotype. As anyone who has dined in Kansas City's fine barbecue establishments will tell you, there are many kinds of barbecue sauce to be found. When I visited Arthur Bryant's and Gates, neither of their sauces tasted anything like KC Masterpiece. 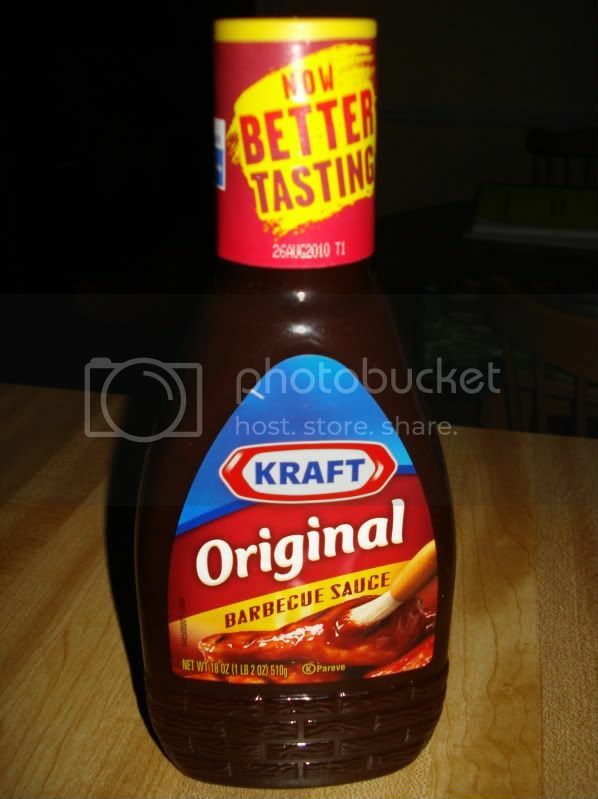 Yet when people talk about "Kansas City style" barbecue sauce, they usually mean thick, molasses-sweetened, and smokey. And that's what KC Masterpiece was when Rich Davis created it in 1977. 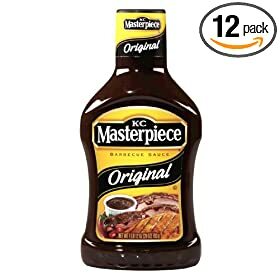 Like Kraft, KC Masterpiece has spawned a variety of different flavors over the years - Honey, Hot 'n Spicy, Hickory Brown Sugar, Mesquite, Hickory, and Sweet & Tangy. But again, we'll stick to the original here. First of all, this is just about the thickest barbecue sauce I've encountered. I almost felt as though I could turn the opened bottle upside down like they do with Blizzards at Dairy Queen. It's some seriously viscous stuff. Its color is dark brown, both from the molasses and caramel coloring, and it's got a bright shine to it. The mouthfeel is completely smooth, with no bits of anything in the mix. The flavor is better than I expected. It's certainly not going to make you forget your favorite barbecue sauce, but compared to that abomination that I tasted last week, it's not bad. The first thing you taste is quick burst of bright sweetness, which gives way to a more brooding molasses sweetness and a teensy bit of vinegar tang. And in the end, this sauce does actually leave you with a little bit of heat that will get a nice mild burn going if you have enough of it. Overall, as with almost all mass-marketed barbecue sauces, this sauce is dominated by sweetness. But for a mass-marketed sauce, you could do a lot worse. I guess you can tell that updating the blog more frequently was not one of my New Years resolutions, but I will try to do better.